A place to learn about the lives of street dogs in Bangkok, Thailand, with emphasis on the individual characters of the Bangkok street dog community and their stories of hardship and humor. This friendly fellow's name is Stretch. He lives in the Sutthisarn neighborhood of northern Bangkok, near a cluster of small streetside noodle shops, a roast chicken seller, a butcher shop, and a 7-Eleven. Stretch is known as a lanky, skinny, tall dog whose emaciated appearance belies his impressive athleticism. His hind legs are the source of his amazing leaping ability, which he utilizes on a daily basis in his never-ending search for food. Stretch's mother was an purebred Greyhound, which accounts for much of his quickness and agility. As a pup, Stretch used to hang out at the Saturday night motorcycle races that take place in many locations all over Bangkok. Chasing these speeding teenagers on motorbikes was not only fun, it also helped Stretch to develop his native talents and become an extremely fast runner. Stretch is also a prolific jumper; so prolific, in fact, that the chicken seller on his street was forced to hire a security guard to watch his shop, after having dozens of his chicken breasts 'disappear' from the countertops. "Every time I would turn my back, or go into the kitchen, all the chicken breasts would be gone, not even a single bone was left," explained the chicken seller. Other restaurant owners and food sellers in the area have reported similar thefts, although no one has yet been able to catch Stretch in the act. 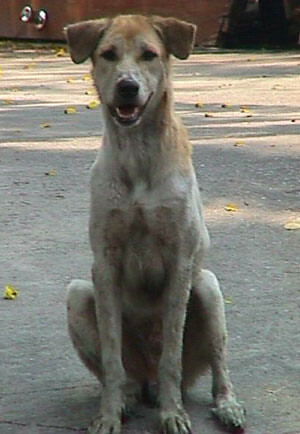 Stretch has become something of a local folk hero in the Bangkok street dog community, because he always shares the food that he steals from local restaurants and markets. In this way, he espouses the Thai concept of kindness and generosity known as nam jai. Oh my gosh...these dogs faces just break my heart. 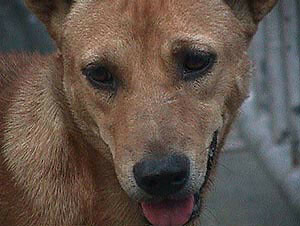 What are the laws in Thailand about NEUTERING the STREET DOGS and NOT KILLING THEM? Please advise. soo cool how stretch actually posed for the camera. He looks so beautiful. I'm Casanova, a 3 year old brown dog of extremely mixed heritage, living on the streets of Bangkok and acting as a voice for Bangkok street dogs and a guide to their community. With me as your guide, this blog will serve as a place to meet members of Bangkok's street dog community, and hear their anecdotes. In reading my posts, you'll get a keen sense of the challenges Bangkok street dogs face, and perhaps better appreciate their ability to stay positive during all the hot, dusty days and hungry nights spent scraping out a living in the Thai capital.